I haven’t written here in quite a while—I’ve switched into “work on research for my dissertation really hard so that I can actually graduate” mode, and with a 21-month old in the mix that leaves very little time for blogging. Still, I do plan to continue writing some here, hopefully more as I get into some new rhythms of life. And I’ve got some exciting factorization diagrams-related projects up my sleeve, so you can look forward to that too. This is a super-fun game with a very simple interface, where you are challenged to construct various things (polygons, circle packings, etc.) using only straightedge and compass, in the finest tradition of the ancient Greeks. It’s like eighth grade geometry class all over again, except fun. I’ve completed 26 of the 40 challenges so far — how many can you do? This entry was posted in challenges, games, geometry, links, meta and tagged ancient, challenge, compass, construction, geometry, greek, straightedge. Bookmark the permalink. Don’t know in what way I’m being dense, but the interface wasn’t simple for me. I gave up, in fact. Maybe I’ll check it out again, or ask someone to help me. Well, “simple” is not necessarily the same as “intuitive”! The latter depends a lot on what you are expecting, previous interfaces you’ve used, etc. etc. Here’s a quick description (let me know if it helps or not): click and drag starting from a point to create either a line (if you drag directly to another point) or a circle (if you drag somewhere so the resulting circle has a radius which passes through another point). The catch is that you can only use points that exist according to the axioms of Euclidean geometry, that is, intersection points of lines or circles you have drawn previously. One thing that took me a long time to figure out is that if you have already drawn a line connecting two points, you can click and drag from one of its endpoints to *extend* the line further (and in fact extending a line doesn’t count as a “move” — because the fundamental Euclidean axiom says you can draw a line through two points to infinity in both directions). However, you don’t really need the ability to extend lines until you get into some of the later challenges. I got the first challenge, so I guess I can figure out more now. Yesterday I couldn’t understand why some circles would disappear, and why I couldn’t make points wherever I wanted. I was trying to make a circle from each of the two given points, and after I made the first one, I couldn’t seem to make a second one. I’m still not sure I know what I’m doing, but now I’ve done a hexagon. It says I did the triangle in 5 moves (I think), and the hexagon in 14. I don’t get the difference between the two images shown, and it says challenges 6 out of 40 near the top, which puzzles me. If you can provide a bit more insight I might love this too. 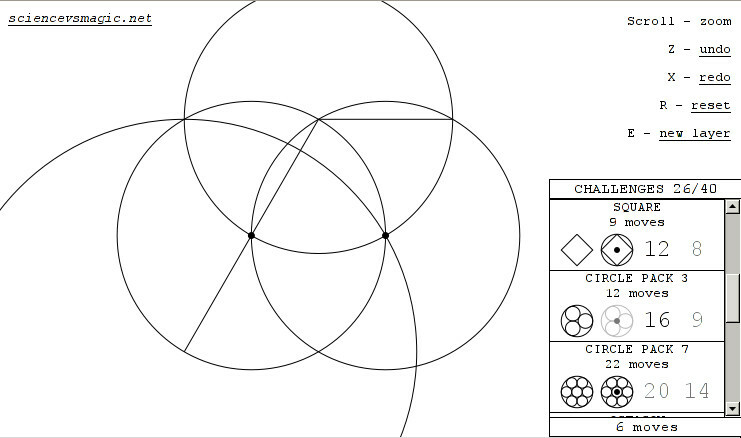 There are four challenges associated with each shape: (1) constructing the shape at all; (2) constructing it “in the origin circle”, that is, inscribed in the very first circle you draw (for some shapes this is more difficult); (3) and (4) are constructing it in some particular numbers of moves (these are the two numbers shown to the right of each shape). 4 challenges per shape times 10 shapes = 40 challenges in total (note you can only see five of the shapes at a time; there is a scroll bar you can use to see more). It’s all making sense now. I’ve gotten 21 of the 40 challenges. Stuck on a number of them. Thanks so much for helping me with the interface.